Any way that an American looks at it the lamestream viewpoint, as promulgated by the MSM, is shocking in it bias, prejudice, and arrogance – or, at least, it should be shocking but we, as a people, have grown inappropriately inured to- and tolerant of these would-be kingmakers. Were it not so perilous for our countries future these caricatures of journalists’ antics as they contort themselves to attack and find fault with GOP presidential nominee Mitt Romney would be hilarious. It’d be far funnier than all but the best of clown acts. But it is perilous for America’s future and the legacy that our children will have to live with. Therefor, these filth’s betrayal of both journalist ethics and America is a clear and present danger to our nation and we should treat it and the MSM’s personnel as such. 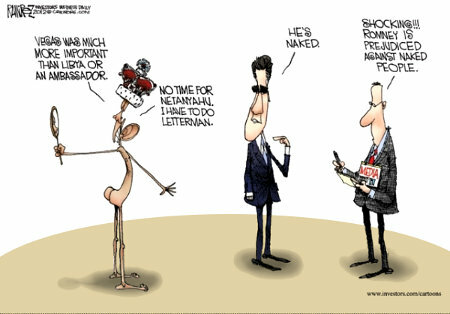 They cannot be allowed to continue to fail to properly report the news in favor of protecting their boy, Obama. Protecting him from his failure is not their job – nor was installing him as POTUS in the first place but that’s another story – even if they are amusing when they try to do so. I mean really! 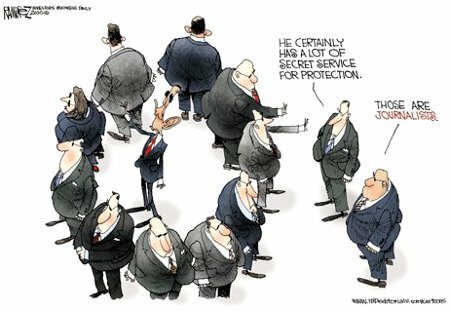 I’ve always been told and believed that the the invidious and unenviable job of protecting Obama fell upon the shoulders of the US Secret service, not the Lamestream media. Of course, that duty is supposedly limited to protecting his life and not his job. Protecting the boy’s job is up to Obama and his handlers, cultists, the Democrat party, and the various PACs and Super PACs that own him – or shall we now describe the MSM as undocumented Democrat PACs? This entry was posted on Wednesday, September 19th, 2012 at 6:32 am and is filed under 2012 Election, Humor, Politics. You can leave a response, or trackback from your own site.